Your Brown & Sharpe Model 1 micrometer is "manufactured in Switzerland" (please read the section at the bottom of this page). This is a professional's micrometer. It's a highly respected old stand-by of superior workmanship. You won't be able to find anything better. The graduations are straight line (you remember those slant lines? Very few people liked them so now they're only available by request).The spindle's carbide face has a slight bevel to minimize the possibility of chipping. A convertible thimble lets you switch between a friction thimble or static "feel" thimble. 1-2" models and larger have plastic heat shields on the frame to minimize metal expansion. The measuring faces are carbide, as expected. The face on the movable spindle has a slight chamfer on the edge which will help keep the anvil from chipping. If you need a perfectly sharp edge for your application, then this micrometer is not for you. Each micrometer comes with a manufacturer's certificate of calibration showing actual data. One more thing: don't be fooled... not all B&S micrometers are Swiss made. You can probably find pretty cheap B&S micrometers made in USA. They're not the same quality, sad to say. Those shown on this page, are the ones worth buying. We've been repairing these for nearly 50 years and we know that they're the best. The larger models have plastic heat shields to protect the frame from expanding. Only model 599-1-32-9 comes in a fitted wood case, the others ship in simple cardboard boxes. Other wood storage boxes are currently unavailable. Approximate list prices are shown below (these change from year to year and may not always be current). You can usually get a better discounted price by placing your order online. *Micrometer standards are used to zero-set the micrometer and, for that reason, you don't need one for the 0-1" model. You will be able to set it to zero with the anvils closed. For an economical alternative, check out the new Brown & Sharpe Classic Master micrometer on page 234. Clean the measuring faces with alcohol to remove the protective oil which the manufacturer has applied. Do not immerse the micrometer in the alcohol, just clean the faces. Close the spindle and lock it in place with the lock. The zero should line up. If there's a slight deviation, insert the spanner wrench into the hole on the barrel and turn the entire sleeve slightly until the zero lines up. If there's a larger deviation then you'll want to remove the thimble cap (which screws off) and loosen the hex set screw. At this point you can slide the thimble into proper alignment. Tighten the hex screw, replace the cap and then make any minor adjustments—if needed—as described above. These micrometers have convertible thimbles. The default is a friction thimble. The idea is that when you close the spindle, the thimble will start to rotate without applying further force on your test piece. This is important because you could inadvertently fudge the reading by over-tightening. The friction thimble makes this impossible. However, some people have developed the skill of measuring by "feel." In other words, they know when to stop turning. If this is your preference you can easily convert your micrometer as follows: Remove the end cap and slide out the plastic sleeve. Invert the sleeve and slip it back in place. Beware of the spring which you'll see on the barrel. The plastic sleeve has to fit easily over this spring. Don't force anything! Put the cap back on, and your micrometer no longer has a friction thimble. Give it a try and see what you think. It's easy to convert back and forth. Your micrometer is accurate only when the surfaces remain parallel. If the thimble develops side play then you can be assured the surfaces are no longer parallel. You can adjust for side play by removing the end cap, loosen the hex screw and slide off the entire thimble. At this point you can use a wrench to tighten the nut—very slightly—at the end of the spindle. You can now check to see if this has corrected the problem. You may have to make several small adjustments to get it just right. Reassemble the micrometer when you're satisfied. Back off the thimble until the measuring screw is free of the bushing threads and clean the parts as required with a solvent such as naphtha or xylol. Dry all parts. Lubricate the bushing threads with a high grade oil applied with a toothpick or eye dropper. Reposition the spindle lock so that the hole will align with the spindle and carefully replace the spindle. Don't force anything. If it won't go in freely then you probably don't have the hole lined up from the spindle lock. You may now have to reset zero as described above. If your micrometer won't function after you've tried these adjustments, by all means send it to us for servicing before you create irreparable damage. We can resurface the faces to make them flat and parallel when they are worn. If the faces are chipped or seriously damaged, we can replace them. 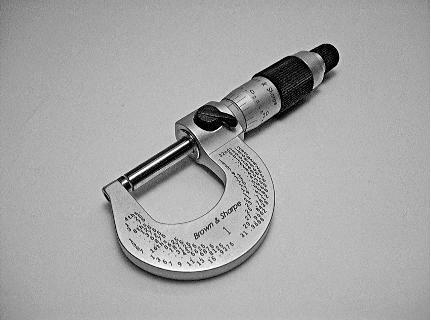 For a discussion of different micrometer brands, how to calibrate them, etc. please see page 29. The Brown & Sharpe chrome-framed outside micrometer has a vernier scale in inch units for taking precise outside diameter (OD) measurements, a convertible friction drive thimble mechanism for uniform or variable pressure during adjustment, and tungsten carbide faces for wear resistance. The micrometer’s frame, thimble, and sleeve have a satin chrome rust- and glare-resistant finish. Frames with a base measurement range greater than or equal to 1” are heat-insulated to help reduce temperature-related expansion or contraction. 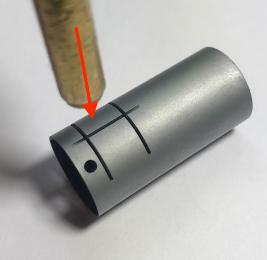 The vernier scale on the thimble and sleeve is graduated to 0.0001”. Graduation markings on the barrel are straight to help reduce parallax errors when reading. The ratchet mechanism can be disabled for variable adjustment control. The spindle and anvil have flat measuring faces and are carbide-tipped for wear resistance. A spindle lock helps provide secure locking of the measurement position. Brown & Sharpe manufactures precision measuring equipment and metrology hand tools. The company, founded in 1833, played a key role in setting industrial standards in the United States. Brown & Sharpe was acquired by Hexagon Metrology in 2001, and is headquartered in North Kingstown, RI. N.b. : the models depicted on this page are manufactured in Switzerland by TESA and are branded Brown & Sharpe for sale in the United States. Q: The sleeve on my Brown & Sharpe micrometer has become very loose. Is there a way that I can tighten it? You will have to remove the sleeve and then bend the two tabs slightly inward (as shown in the photo). This will create the desired friction. 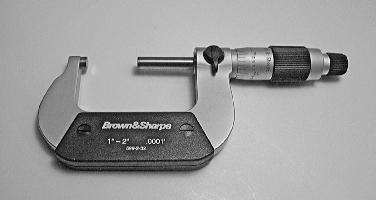 Q: I purchased model 599-1-32 -9 Brown & Sharpe micrometer from your amazon store linked from your website. Your website says this model is the top of the line micrometer made in Switzerland. My micrometer showed up and says it was made in France. I have used chinese micrometers at a fraction of the cost and the quality is 'almost' indistinguishable so the premium is clearly for the "Swiss made" aspect. If this is the case I will be returning this particular micrometer and ordering one of your B&S value line products for half the price. I grew up using Swiss made instruments and have great respect for their quality but i would rather buy American over French if those are the only options.. The manufacturer, TESA, has its facilities on Lake Geneva in Switzerland and they have had a manufacturing plant just across the border, in France. I was not aware that some of these mics are still assembled there. They remain top-of-the line in our opinion. If the issue is purely political, then you should certainly return the gage. Our guess, however, is that you have received very old stock.